Are you a new freelancer? Are you getting trouble to select a perfect title for your upwork profile? 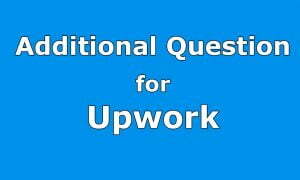 Really, it’s an important matter to select a suitable & professional upwork title to attract your client. It’s the most important thing for a freelancer to be successful on upwork. Your title is that important key to your success that will determine your job category to your client. So, a perfect title is your most prominent thing to make money by freelancing. If you don’t know what should be your title, don’t worry. We are here to make you understand which title will match your work and bring you more money by freelancing. Another two important facts are Upwork Cover Letter and Upwork Overview those can help you to attract your client. How & what should be your title? Always remember that your title must reflect your skill and experience. Choose your title in a way so that your client get to know what type of work you do from your title. Your title is a kind of summary of your expertise. So, a wise title is necessary to use. Don’t use a lengthy title. Rather a short and meaningful title is much helpful. Try to use a title consists of less than 10 words. But all the keywords should be fit in your title that will make a good impression of you. If you are expert of multiple varieties of tasks then place your primary job first in your title. But we recommend you not to use more than two types of variety of your profession. Just highlight your specific area of advertise. You need not show yourself as an “Entrepreneur” or as “Jack of all Trades”. Simple and succinct title will make the impression that you are dedicated to that specific work only. While choosing a title it is normal that one thinks about what they do, which service they provide for, which area they are expert of etc. But it’s not the right way to choose a title. Rather you must think of what your client may get from you. Think of how your clients may be benefited by you. This is the right way to choose a distinctive title to attract your clients and be hired. All your attention give to your client. Focus on the advantages that your client may get from you. Serious clients always look for serious freelancers. Your perfect and professional title means the serious impression of you. So, choose a professional title according to your work. But don’t use an ambiguous or complex title that will make your client turn to the opposite. Here you will get some example of choosing best titles to some specific professions that will help you to choose your own. But don’t use only “Customer Service” as your title as it is too vague you know. and something like this kind. Use such a title so that your title speaks that you are a designer and a creative designer. to attract your client and get popularity. You should use your own sense also to attract your client through your title. etc. will suit you most. Here are some other titles that you may use if your job matches with these. These will surely impress your client and they will get a clear idea about your work also. Hey, you need not be serious always. It often happens that some freelancers get much popularity for their funny titles. They become well known to their clients with their funny titles. It represents your creative side. You may be heard the names like Social Media Rockstar, Captain of Design, Video Ninja, Copywriting Ninja, Graphics Guru etc. in some cases. These titles are quite attractive and work comparatively fast than the other serious titles. But you must use it in a creative manner. But remember that these funny titles won’t be suitable to all professions. You can use these funny titles only if you are in creative profession or if you work for children. But you should use your own creative name for the purpose. Don’t use a common name as a title. It will destroy your popularity as a creative employee. There are many freelancers who do not work for one type of work. They are skilled of various tasks and they want job of these various types also. In such case your title will also be used for multipurpose. It must have the ability to draw attention of the clients who wants those kinds of works done by you. In such case you must use all the key words of your skill in your single title. But you must put your primary skill in the first place and then the other. But remember that a concise title is always better than a longer one. So, don’t try to add your unnecessary or unimportant skill in your title. Try to limit it within 10 words.